These excellent new sets contain the latest innovations including cams and linkages which will help to inspire future engineers, encouraging students to create recognisable models of engines, fairground rides and many other familiar mechanical creations. A full set of comprehensive work cards will help to guide the user quickly and efficiently. 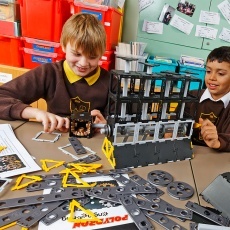 One of the unique points about this new and innovative set is that the pieces are completely interactive with Polydron Original and Frameworks pieces, and so will complement all existing classroom stocks. A must for any design and technology class.